The University of New Brunswick has received $3.1 million in support from the Natural Sciences and Engineering Research Council (NSERC) for discovery research. The investment was presented to UNB by Matt DeCourcey, Member of Parliament for Fredericton, on behalf of the Honourable Kirsty Duncan, Minister of Science and Sport, and is part of the more than $558 million in funding for researchers and students at institutions across Canada that was announced by Minister Duncan on Oct. 9. At UNB, 25 researchers have received discovery grants as part of the funding. They are experts in the fields of: biology; computer science; Earth sciences; geodesy and geomatics engineering; forestry and environmental management; kinesiology; mathematics and statistics; mechanical engineering; electrical and computer engineering; and physics. This year, as part of the $558-million investment, the NSERC Discovery Grants program is providing more than $5 million in supplements for early-career researchers, ensuring the next generation of scientists, engineers and researchers will have the tools they need to flourish. "Researchers at the University of New Brunswick are leading experts in their fields, completing world-class research. 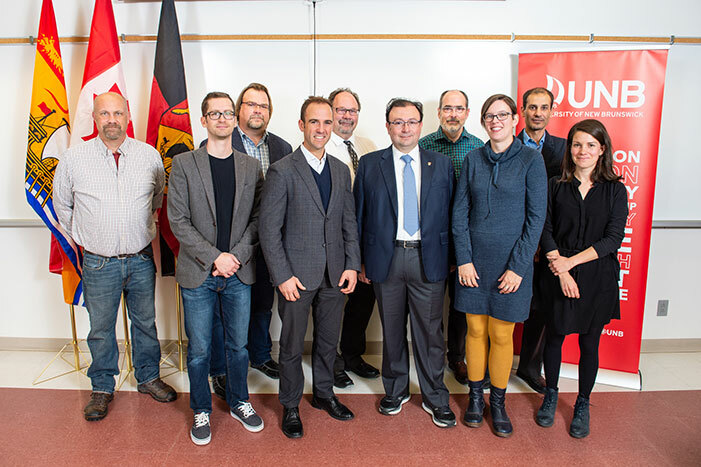 A new investment of $3.1 million from NSERC will allow 25 UNB researchers to continue making discoveries, challenging the knowledge we have today, and propelling our world into the future"
"When researchers and students are given support to push boundaries of knowledge, their discoveries can lead to innovations that grow our local economy and help ensure Canada has a workforce capable of taking on the challenges of today and tomorrow. I congratulate all of the recipients at UNB for their incredible achievements and look forward to their many future successes in the sciences and engineering." Photo: From left to right: Joe Nocera, Barry Blight, Joe Hall, Matt DeCourcey, Dave MaGee, Luigi Benedicenti, Eric Aubanel, Amy Parachnowitsch, Saleh Saleh, Audrey Limoges. Photo credit: Cameron Fitch/UNB. NSERC invests over $1.2 billion each year in natural sciences and engineering research in Canada. Our investments deliver discoveries-valuable world-firsts in knowledge claimed by a brain trust of over 11,000 professors. Our investments enable partnerships and collaborations that connect industry with discoveries and the people behind them. Researcher-industry partnerships supported by NSERC help inform research and development and solve scale-up challenges. NSERC also provides scholarships and hands-on training experience for more than 30,000 post-secondary students and post-doctoral fellows. These young researchers will be the next generation of science and engineering leaders in Canada.